The built in Safari (lite) browser on the iPad is quick and generally gets the job done. It zooms in/out, formats pages as needed, quick to launch, has a quick Google search box and on the iPad you can see a screen of all the open pages you have running at the time. No matter how good something is for one person, another right next door will want some extra feature it is lacking. If your looking for Flash, stop, it wont be happening from Apple. For the Google fan, there are many apps that will let you download and edit your Google docs (like Office2Pro). 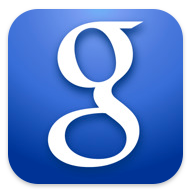 Google themselves have an app to enhance your search experience… with a new ‘iPad’ version now available. Via this app, you can do a voice search. Just launch the app and say what your looking for. Google translates and shows you their normal search result – without the need to go to Safari. 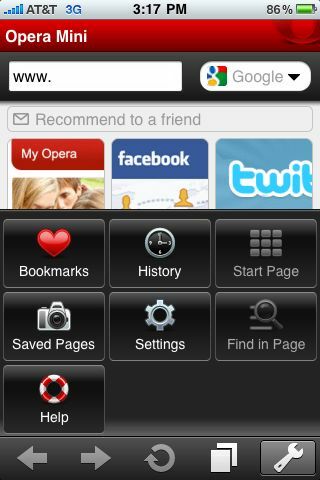 Along with searching, the app offers quick access to your Google Web apps.. Almost all carry the usual Web experiences so while you could just go to Safari and get to the same place, this app offers a single launch location so you don’t have to type in any URLs (or go through your Safari bookmarks). Apple does offer devs the opportunity to use Safari directly from their app if they need a Web browser page to view. A surprise in the iTunes App store was the appearance of the Opera Mini Browser – so now you can have two full Web browsers on your iPad. The version currently offered is for the iPhone screen size so you can install on your iPad but will have to run in 2x mode to fill the screen – pretty low resolution then. The difference you will see with the Opera Mini Browser option is tabbed browsing, speed dialing (bookmarks with icons), long click menus (holding on a menu shows different options), synchronized bookmarks and ‘remember passwords’. We noticed a slight slowness compared with Safari which we think is caused by all Web page requests go through the Opera servers to be formated for the mobile screen sizes. This might be concerning to people visiting secure Web sites where they are entering their passwords.